What a difference it makes when a country has the consistency of purpose (post Pinochet) over sustained periods of time across multiple presidents and political parties. While enormous challenges remain ahead, Chile, and in particular Santiago, has become a modern and efficiently functioning world capital. Its economy is wide open, and more recently it has positioned itself as the innovation capital and the entrepreneurial hub of Latin America. When president Piñera took charge as the new president in 2010, an earthquake level 8 shook up southern coast and the tsunami that followed inflicted additional losses, 33 miners were trapped 700 meters under the ground in a copper-gold mine, etc…. the country recovered from these disasters with confidence and joined that same year the OECD – a selected group of developed nations – and launched one of the most talked public policy programs to promote innovation and entrepreneurship in the world: Start-up Chile. This was not always the case. In the colonial days, Chile was “the poor cousin of the south-west” due to the lack of gold and silver sought by the conquistadores and its geographical isolation. The country is sandwiched between the Andes and the Pacific Ocean, giving the country its unique shape of approx. 3000 miles long and 100 miles wide. After the construction of the Panama Canal, its isolation grew even greater as ships could avoid the southern route by taking instead the new passage across Central America. The experimentation with communism and its military coup that followed (Pinochet — 1973) added more pain to a society already near breakdown. This is to show that a country can turn itself around in a relative short time (a few decades) if there is a consistent effort to increase transparency, enable the market to play by its rule, ease regulation to reduce economic friction and empower all sectors of the society, in particular the marginalized: women and the lower income of society. Much yet remains to be done, but nonetheless and impressive accomplishment! Development of human capital is high in the Chilean agenda. We learned in Fundación Chile about the human capital needs over the next 5 to 10 years to meet the expansion of all the key sectors of the economy: mining, farm fishing, high-end agribusiness, and global services are dependent on human capital. While Start-up Chile is a step in the right direction, attracting from across the world innovators and entrepreneurs, its spill-over effects will no be enough. Hence an education policy, at all levels, and in particular one targeting the tertiary level has become a pressing need to enable the continued economic growth. The student movement over the last two years was a conversational theme in most of our visits, which highlights the need of wide access to a world-class price/performing education. This challenge remains, staring in the eyes to continue its development. As we studied the innovation and entrepreneurial ecosystem in Santiago, we observed that key organizations are focusing on the creation of social as well as economic value. In other words, stressing the importance of Planet and People as well as Profits (the famous 3 P’s). We were in particularly challenged to think differently as we visited Social Labs the innovation spin-off of Techo. But there was more, we had the opportunity to meet with women entrepreneurs working hard to empower women and close de gap in a society (as most of Latin America), which since colony days has been male dominated. We also met with environmental activists, which offered different perspectives as they presented views to preserve Patagonian wilderness. Chile–California Connection: this partnership dates back from the gold rush and hence linking historically Chile to Northern California since its very early days. As the news of the new wealth found (circa 1848) reached Valparaiso (one of the most important ports of the Pacific Coast at the time) first than most other places, thousands of Chilean miners arrived to the Bay Area. Since then both regions have been connected in multiple ways: business, education, social and cultural. More recently (2004) Chile signed the free trade agreement (the second in the Western Hemisphere following NAFTA) with the USA and in 2008, The Chile-California Strategic Partnership for the XXI Century. Today young Chilean entrepreneurs have embraced this connection to the Bay Area being a destination to grow their start-ups as they seek technology partners, funding or to scale globally their markets. 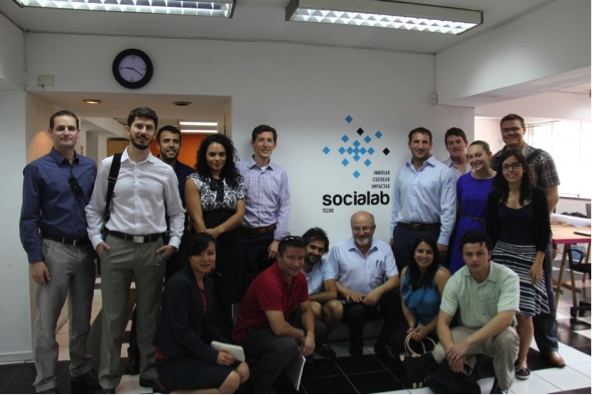 Our visit to Start-up Chile co-working space in Santiago was an amazing experience. I have experienced many times interdisciplinary global teams working together. What truly impressed us was its size. We spent time meeting dozens of entrepreneurs from all over the globe working, living, studying and playing in Santiago. It was an infectious and contagious experience. Their energy level, entrepreneurial attitude and commitment to make history to be part of one of the most revolutionary experiments in transforming a society was insane. Not to be forgotten is that this transformation requires cash and Chile is hard at work developing a venture capital industry, today already well advanced, as we met partners of Austral Capital and InverSur Capital. Santiago was an amazing experience and proved that these fast transformations are possible! Until my next posting from Buenos Aires – Carlos B. The connection included New York through the Braden Copper Company was founded in 1904 by Barton Sewell and William Braden, who in 1905 bought the Chilean copper mine. Barton Sewell never visited Chile and was limited to participating in the business as an upper executive at the companies central offices in New York. After Barton Sewell died in 1915, the Guggenheim brothers began to open new copper deposits in the north of Chile. They finished by taking control of the Braden Copper Company so that by 1916, 95 percent of the Braden Copper Company’s stock was in the hands of the Kennecott Corporation, the Guggenheim brothers firm. In 1935, the Braden Copper Company signed the World Copper Agreement along with the rest of the world’s principle mining companies. In 1945, the company constructed the Braden Copper Stadium in the city of Rancagua, now called Estadio El Teniente. This stadium would be seat of the 1962 FIFA World Cup. In accordance with the Chilean nationalization of copper, by 1967 the Chilean government had acquired 51 percent of the stock in the Braden Copper Company. By 1971, the company was completely nationalized.